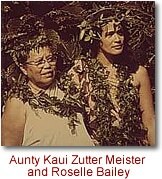 Our beloved teacher and guide, Roselle Keli`ihonipua Bailey, comes from both Hawaiian and European ancestors. She grew up in Lahaina on the island of Maui, where she began learning Hula from an early age on. Her formal Hula masters were Emma Sharp from Maui, Edith Kanakaole from Hawai`i and Kaui Zuttermeister from Oahu, as well as her mother and father. After growing up in Hawaii blessed with a strong Hula influence in her everyday life, for several years Roselle, her husband Jim and their two daughters, Sharon and Pohakalani, lived in the Middle East and then traveled through Europe, where she continued to teach and perform Hula. In 1971 the family moved back to the Hawaiian Islands, where they made their home first in Hilo on the island of Hawai`i and later on the island of Kaua`i. 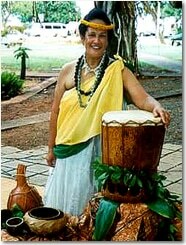 There Roselle founded her Halau and began formally instructing students in the art of Hula. 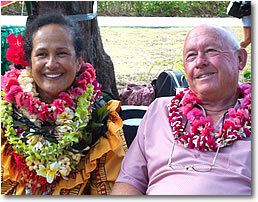 In 1994 Roselle and Jim moved back to Maui where they are still residing. Roselle’s life of service has included constant teaching for all who desire deep growth and healing through immersion in Hula. Throughout the year, she instructs her Hula groups on the various Hawaiian islands, as well as organizing performances and cultural exchanges with other countries such as New Zealand, Canada, Samoa, the Solomon Islands and Germany. She also helped promote and support the filming of documentary television programs on various aspects of the Hula tradition. Along with teaching Hula, Roselle is an active member of the Hawaiian Sovereignty movement. She is a bright light to all of us, embodying the ancient teachings of her tradition, thus helping us heal our hearts and awaken our souls. Used with permission of Art & Culture on Maui & Full Circle Publishing, Inc.